German codifier and Biblical commentator; died at Toledo, Spain, before 1340. Very little is known of Jacob's life; and the few glimpses caught here and there are full of contradictions. 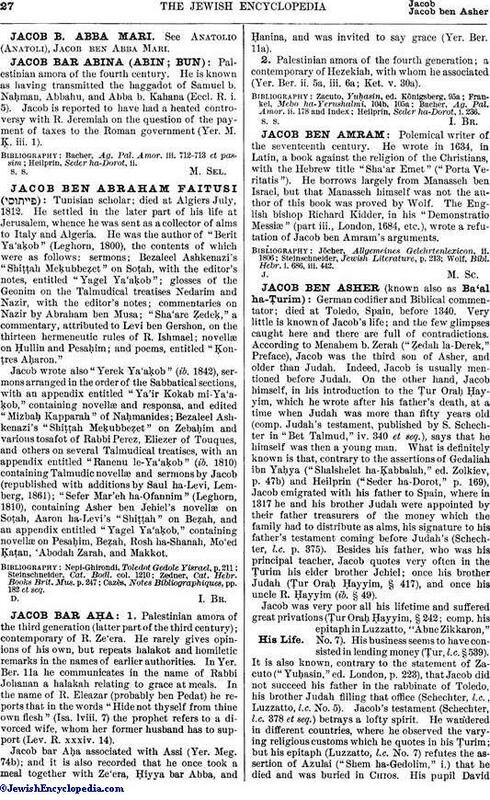 According to Menahem b. Zerah ("Ẓedah la-Derek," Preface), Jacob was the third son of Asher, and older than Judah. Indeed, Jacob is usually mentioned before Judah. On the other hand, Jacob himself, in his introduction to the Ṭur Oraḥ Ḥayyim, which he wrote after his father's death, at a time when Judah was more than fifty years old (comp. Judah's testament, published by S. Schechter in "Bet Talmud," iv. 340 et seq. ), says that he himself was then a young man. What is definitely known is that, contrary to the assertions of Gedaliah ibn Yaḥya ("Shalshelet ha-Ḳabbalah," ed. Zolkiev, p. 47b) and Heilprin ("Seder ha-Dorot," p. 169), Jacob emigrated with his father to Spain, where in 1317 he and his brother Judah were appointed by their father treasurers of the money which the family had to distribute as alms, his signature to his father's testament coming before Judah's (Schechter, l.c. p. 375). Besides his father, who was his principal teacher, Jacob quotes very often in the Ṭurim his elder brother Jehiel; once his brother Judah (Ṭur Oraḥ Ḥayyim, § 417), and once his uncle R. Ḥayyim (ib. § 49). Jacob was very poor all his lifetime and suffered great privations (Ṭur Oraḥ Ḥayyim, § 242; comp. his epitaph in Luzzatto, "Abne Zikkaron," No. 7). His business seems to have consisted in lending money (Ṭur, l.c. § 539). It is also known, contrary to the statement of Zacuto ("Yuḥasin," ed. 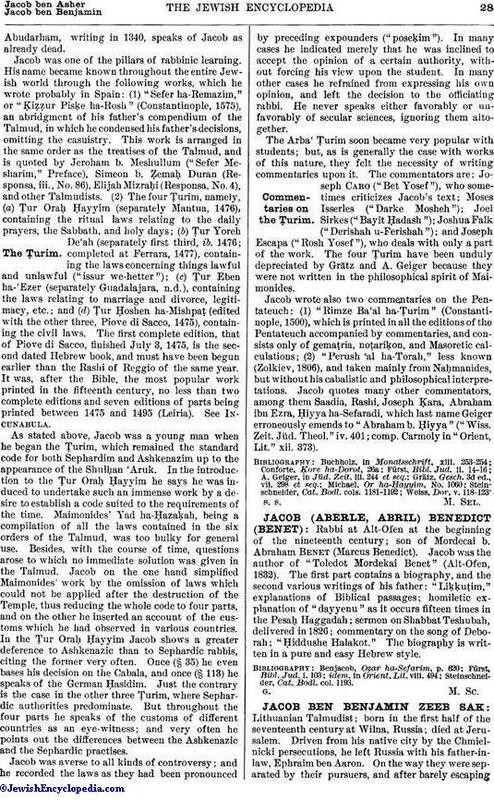 London, p. 223), that Jacob did not succeed his father in the rabbinate of Toledo, his brother Judah filling that office (Schechter, l.c., Luzzatto, l.c. No. 5). Jacob's testament (Schechter, l.c. 378 et seq.) betrays a lofty spirit. He wandered in different countries, where he observed the varying religious customs which he quotes in his Ṭurim; but his epitaph (Luzzatto, l.c. No. 7) refutes the assertion of Azulai ("Shem ha-Gedolim," i.) that he died and was buried in Chios. His pupil DavidAbudarham, writing in 1340, speaks of Jacob as already dead. Jacob was one of the pillars of rabbinic learning. His name became known throughout the entire Jewish world through the following works, which he wrote probably in Spain: (1) "Sefer ha-Remazim," or "Ḳiẓẓur Pisḳe ha-Rosh" (Constantinople, 1575), an abridgment of his father's compendium of the Talmud, in which he condensed his father's decisions, omitting the casuistry. This work is arranged in the same order as the treatises of the Talmud, and is quoted by Jeroham b. Meshullum ("Sefer Mesharim," Preface), Simeon b. Ẓemaḥ Duran (Responsa, iii., No. 86), Elijah Mizraḥi (Responsa, No. 4), and other Talmudists. (2) The four Ṭurim, namely, (a) Ṭur Oraḥ Ḥayyim (separately Mantua, 1476), containing the ritual laws relating to the daily prayers, the Sabbath, and holy days; (b) Ṭur Yoreh De'ah (separately first third, ib. 1476; completed at Ferrara, 1477), containing the laws concerning things lawful and unlawful ("issur we-hetter"); (c) Ṭur Eben ha-'Ezer (separately Guadalajara, n.d.), containing the laws relating to marriage and divorce, legitimacy, etc. ; and (d) Ṭur Ḥoshen ha-Mishpaṭ (edited with the other three, Piove di Sacco, 1475), containing the civil laws. The first complete edition, that of Piove di Sacco, finished July 3, 1475, is the second dated Hebrew book, and must have been begun earlier than the Rashi of Reggio of the same year. It was, after the Bible, the most popular work printed in the fifteenth century, no less than two complete editions and seven editions of parts being printed between 1475 and 1495 (Leiria). See Incunabula. As stated above, Jacob was a young man when he began the Ṭurim, which remained the standard code for both Sephardim and Ashkenazim up to the appearance of the Shulḥan 'Aruk. In the introduction to the Ṭur Oraḥ Ḥayyim he says he was induced to undertake such an immense work by a desire to establish a code suited to the requirements of the time. Maimonides' Yad ha-Ḥazaḳah, being a compilation of all the laws contained in the six orders of the Talmud, was too bulky for general use. Besides, with the course of time, questions arose to which no immediate solution was given in the Talmud. Jacob on the one hand simplified Maimonides' work by the omission of laws which could not be applied after the destruction of the Temple, thus reducing the whole code to four parts, and on the other he inserted an account of the customs which he had observed in various countries. In the Ṭur Oraḥ Ḥayyim Jacob shows a greater deference to Ashkenazic than to Sephardic rabbis, citing the former very often. Once (§ 35) he even bases his decision on the Cabala, and once (§ 113) he speaks of the German Ḥasidim. Just the contrary is the case in the other three Ṭurim, where Sephardic authorities predominate. But throughout the four parts he speaks of the customs of different countries as an eye-witness; and very often he points out the differences between the Ashkenazic and the Sephardic practises. Jacob was averse to all kinds of controversy; and he recorded the laws as they had been pronounced by preceding expounders ("poseḳim"). In many cases he indicated merely that he was inclined to accept the opinion of a certain authority, without forcing his view upon the student. In many other cases he refrained from expressing his own opinion, and left the decision to the officiating rabbi. He never speaks either favorably or unfavorably of secular sciences, ignoring them altogether. The Arba' Ṭurim soon became very popular with students; but, as is generally the case with works of this nature, they felt the necessity of writing commentaries upon it. The commentators are: Joseph Caro ("Bet Yosef"), who sometimes criticizes Jacob's text; Moses Isserles ("Darke Mosheh"); Joel Sirkes ("Bayit Ḥadash"); Joshua Falk ("Derishah u-Ferishah"); and Joseph Escapa ("Rosh Yosef"), who deals with only a part of the work. The four Ṭurim have been unduly depreciated by Grätz and A. Geiger because they were not written in the philosophical spirit of Maimonides. Jacob wrote also two commentaries on the Pentateuch: (1) "Rimze Ba'al ha-Ṭurim" (Constantinople, 1500), which is printed in all the editions of the Pentateuch accompanied by commentaries, and consists only of gemaṭria, noṭariḳon, and Masoretic calculations; (2) "Perush 'al ha-Torah," less known (Zolkiev, 1806), and taken mainly from Naḥmanides, but without his cabalistic and philosophical interpretations. Jacob quotes many other commentators, among them Saadia, Rashi, Joseph Ḳara, Abraham ibn Ezra, Ḥiyya ha-Sefaradi, which last name Geiger erroneously emends to "Abraham b. Ḥiyya" ("Wiss. Zeit. Jüd. Theol." iv. 401; comp. Carmoly in "Orient, Lit." xii. 373).